Samuel Beckett, one of the great avant-garde Irish dramatists and writers of the second half of the twentieth century, was born on 13 April 1906. He died in 1989. He won the Nobel Prize for Literature in 1969. 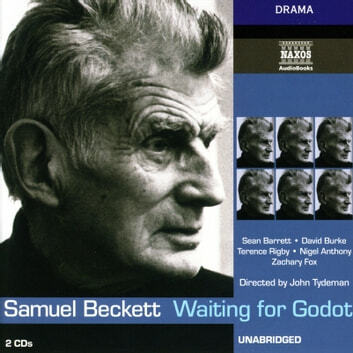 His centenary will be celebrated throughout 2006 with performances of his major plays, but the most popular of them all will be, without doubt, the play with which he first made his name, Waiting for Godot. It opened the gates to the theatre of the absurd as four men appear on the stage, apparently with purpose but (perhaps) waiting for someone called Godot. It is stark, funny, bemusing and still deeply affecting half a century since its first production. In this new recording for audiobook, John Tydeman, for many years head of BBC Radio Drama, takes a fresh look at one of the milestones in Western drama. It follows the highly acclaimed recordings of Beckett's Trilogy, Molloy, Malone Dies and The Unnamable published by Naxos AudioBooks.